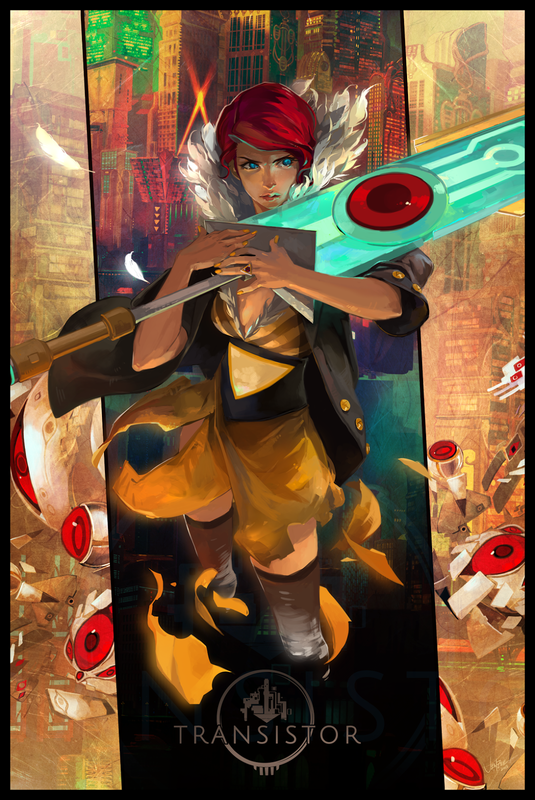 Transistor throws you into the deep end from the get go. You play as Red, a pop-music sensation in the futuristic city of Cloudbank whose night has taken a turn for the worse. Red comes into the possession of a mysterious weapon, the Transistor. No sooner as she does, a flood of robotic entities known as the Process are out to get her. Who ruined your night? Who are the Process? What is the Transistor? These are the questions which drive Red forwards. Although Red has no voice, the Transistor does. As in Supergiant’s previous game, Bastion, the detail of the world and story comes through the narration. As you navigate dark alleyways and pass old city take-out joints, the Transistor constantly provides scattered context for where you are and what you’re witnessing. The narration is in the present tense, an interesting stylistic choice, even if it means the effects are not as pronounced or resonant as in Bastion. 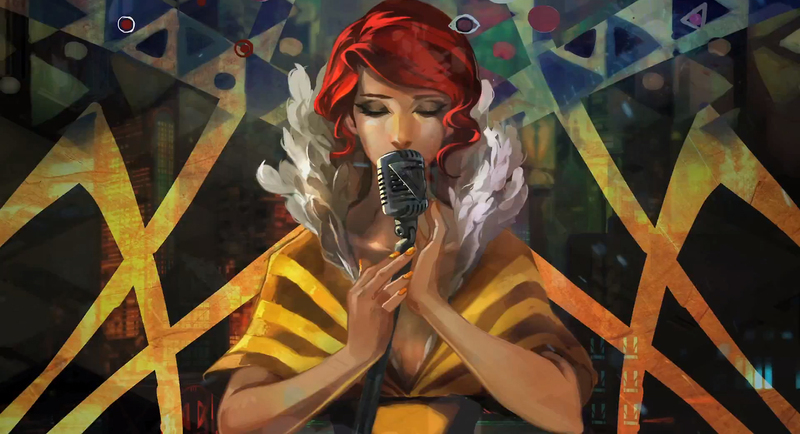 The most striking thing about Transistor is its aesthetic. Supergiant really knows how to create unique tones and atmosphere. Cloudbank, the city in which the game is set, is resolutely cyberpunk, but there are also many dark, gothic touches as well as decorative inspiration taken from art nouveau. Sure, there’s the influence of Blade Runner, but more classic elements from the inter-war period punctuate the scenery. The cityscape’s neon lights are draped over a modernist texture, with New York-style art deco skyscrapers and iron-grated rooftop gardens, industrial lifts, AC fans and water tanks. It’s a great art style, and it works wonderfully. There’s a real abundance of colour, but it’s never over-saturated or twee, and always retains a contemplative darkness. The sound design is similarly distinct, the music often mixing synthetic noise with urban Blues and Red’s own pop vocals. 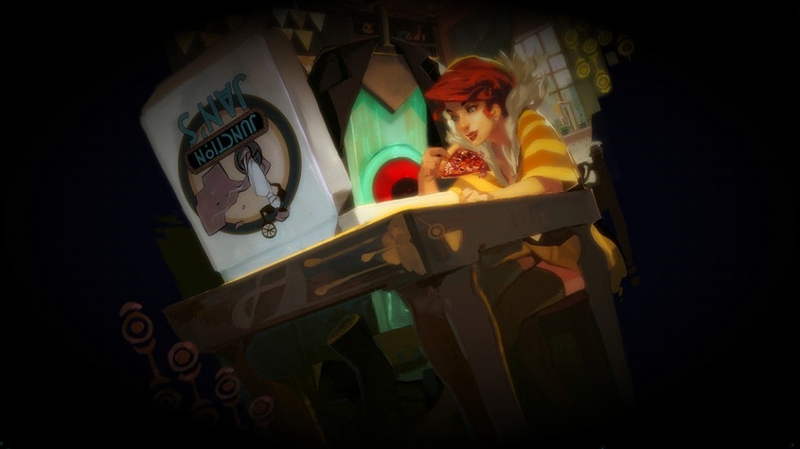 There are more than a few American pop-culture sensibilities in Transistor. There’s pizza and motorbikes, as well as the main character’s own popular music career, of course. It’s in the details and small moments – a quick stop at a fast food restaurant told through a couple of slides of art, or gazing out upon a night-time vista – that the story comes through most forcefully. The plot alone is a little weak, which at times feels thematically trivial, as well as a retread of Supergiant’s last game, with its core of creativity and rebuilding – however, the tone and atmosphere of Transistor are things of genuine value and beauty. 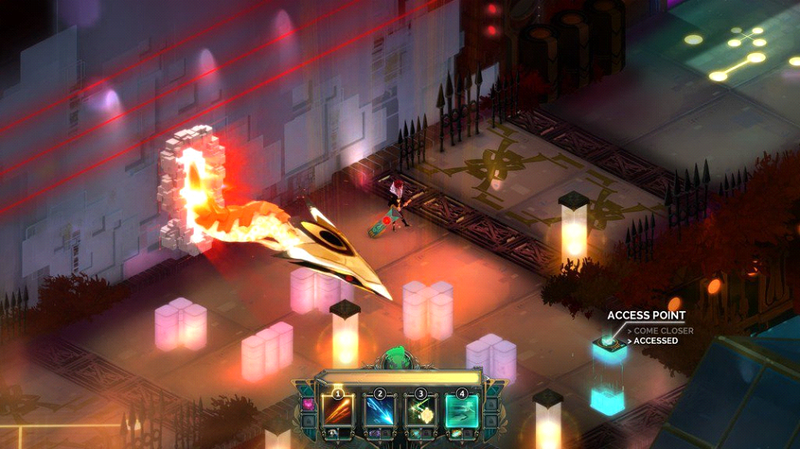 Transistor is predominantly made up of two things: an aesthetic and a combat system. The combat flows out of the titular weapon. The Transistor allows you to use up to four special abilities, called Functions, which you gather at different points in the game, or attain when levelling up. It also allows you to pause time, tactically darting about and lining up your hits, which take up action points, and then executing them at a hyper-pace. Combat occurs in skirmishes, obstacles spawn, providing cover from attacks, and the city block is closed off into a miniature arena. The turn-based/planning phase is the critical element in combat. Although the game allows you to fight without it, most of the Functions are far too slow to line up and difficult to execute with any kind of precision. Often, I would rely on the skills Jaunt and Mask in order to evade enemies completely. Jaunt allows you to zip around the arena quickly, whilst Mask is a stealth ability that conceals you for a small amount of time, as well as amplifying your next attack. With these two abilities, you can essentially become immune to damage until the turn-based phase finishes cooling down. When the turn-based mode is active, enemies are near motionless. You can dash around their flank and line up a series of blows so devastating that when time begins to flow again, there will be nothing left but a few charred pixels blowing gently down the alley. 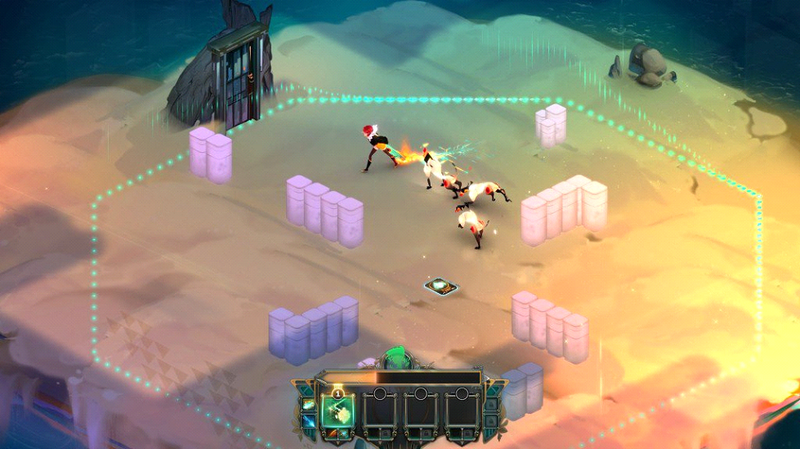 Combat in Transistor is a real visual spectacle. The animations are superbly smooth, and the effects varied. There’s a lot of choice for the Functions in combat, too – 16 unique Functions for you to experiment with. You can only use four at one time, but each possess two upgrade slots so you can further personalise them. If you’re not using your stun or stealth ability, for example, you could add both to your evasive Jaunt, so now when you zip across the arena, you stun foes and gain a short period of invisibility. Alternatively, you could add your stun and stealth ability to a damaging Function, or perhaps one of the damaging abilities to one with more utility. There are also slots for passive abilities – so each Function, instead of taking an active role, has a passive effect that will improve that characteristic generally. It’s an extremely elegant system, which allows for some fascinating combinations. In terms of your load out, there is a ton of possibilities, but I question how meaningful these choices really are, and how much they affect your overall play style. It seems as though the turn-based phase is overpowering, whilst the real-time action is either too stilted or chaotic to encourage anything beyond passivity or aversion tactics. Whilst Functions are varied, it can be straightforward to stack a couple of abilities in order to maximise damage, and rely on these in the turn-based phase to backstab enemies. The myriad of Functions are different flavours in an ice-cream parlour – there are some tasty choices, but they’re probably not worth too much thought in the grand scheme of things. The rest of the combat is about avoiding getting overwhelmed, hiding, and sometimes even exploiting enemies through jukes around the terrain. Enemies can possess different special abilities, which should require different approaches, but again the turn-based mode tends to work too effectively, paving over the intricacies and differences with the singular flick of a button. Whilst the real time combat can be messy and unviable, the turn-based mode is slightly underdeveloped. It can be tactical in terms of efficiency, getting the most out of your turn, but it’s a rapid and one-sided process where enemies never have the opportunity to retaliate, meaning there isn’t much technicality or long term planning involved beyond chipping away at the enemy force bit by bit. When you do finally meet enemies on par with Red’s own abilities, it’s unfortunately more comical that tactical. Supergiant attempted to create a combat system robust enough for a great amount of replayability, and despite the unevenness of the combat, Transistor is worth experiencing, It’s probably worth revisiting, too. Some way into the game, you come across a backdoor into a cyber-Sandbox. There are challenges to complete here, some of which help hone in on specific abilities and allow you to appreciate the attention put into the different enemy types and abilities – before you pause, run around, and destroy them from behind, of course. 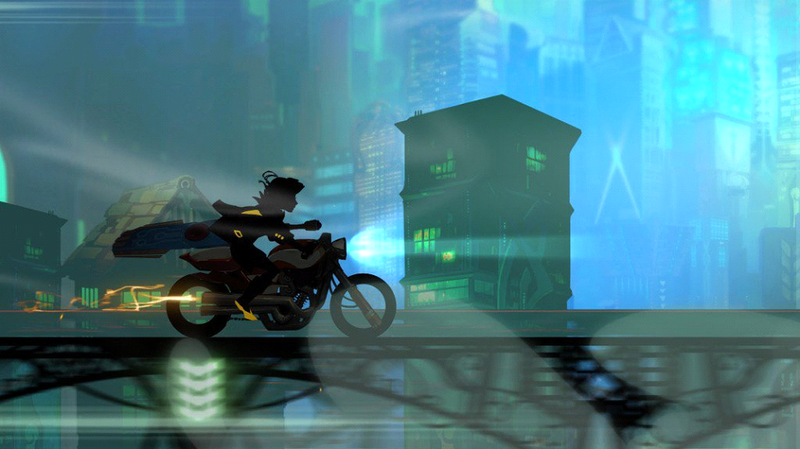 Like Blade Runner, Transistor may need a Director’s Cut to achieve its full potential. It offers little beyond a grand ambience and its somewhat imbalanced, but visually impressive, combat system. Is that enough? It was for me. The short tale has trouble gaining momentum, and the compelling atmosphere trails off towards the end. The combat ramps up, becomes more challenging in new game plus, allowing you to activate a set of handicaps called Limiters — which can make things a little more diverse. However, the turn-based mode is the principle crutch, and all those different flavours of abilities still boil down to a much narrower process. It feels as though Transistor was only a few changes away from being great. What must have began as an intriguing concept for the combat, unfortunately, ended up imprisoning variety and narrowing the sandbox, as opposed to confidently structuring it.